Regens. Newgens. I am sure you are all aware of those game generated (not real) players with funny hair cuts. It's a love or hate part of the game that is necessary to keep players as many seasons into the future as you'd like. Youth intake. It happens every single year. A fresh breed of young players are injected to various youth academies throughout the world. If you can keep tabs on these hot prospects soon enough, you could be in for a treat. How to find the best regens as soon as they are generated? This article will help you pinpoint the dates for every country and give you an edge that will enable you to steal them before they go to the big clubs. Knowing the dates that regens from certain countries are generated, takes away the AI advantage and let you play on level terms. You will know exactly when to send your scouts to scan a certain nation to discover the next generation of raw gems that will take the football world by storm. Remember that regen / newgen players are generated by the game to enable you to keep playing indefinitely as real footballers retire. It’s not uncommon to find regens with amazing abilities that is almost unreal (pun intended). 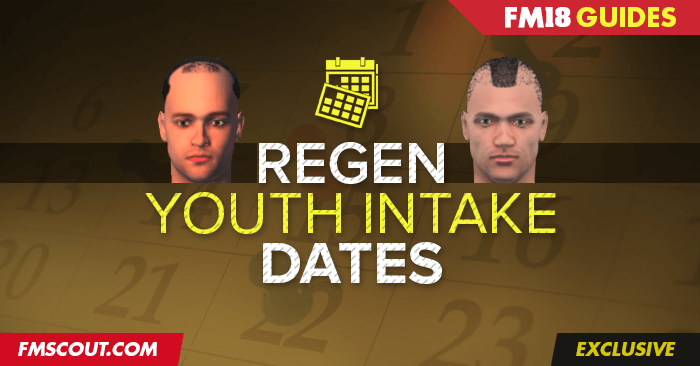 I’ve holidayed 4 years into the future in order to find the regen youth intake dates for FM 2018. The dates listed below reflect the first 4 seasons from October 2017 until September 2021. It's not the same day every year, though it fluctuates by up to 2 weeks give or take. So far in my 6 months of playing this version, the youth intake date in Estonia has NEVER been in February, but in September (where it fluctuates by up to 2 weeks). The dates are not the same day every year, it fluctuates by up to 2 weeks give or take. England 28 february in another save. Seems like they made it pretty random this year. Every nation that should have regen dates on march 5 (as posted) had it on 28 february on my save, not only england. italy - 14 march 2018.